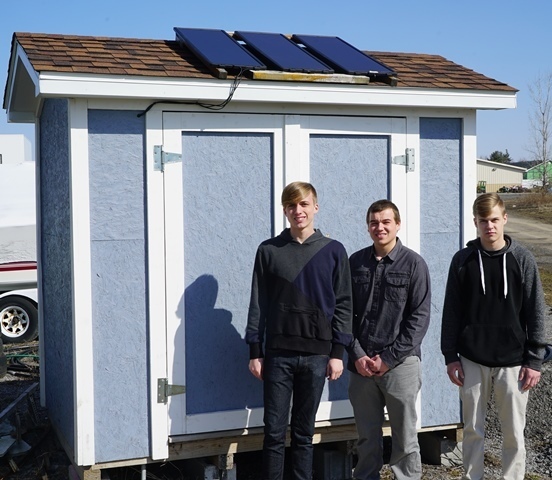 As the 2017-18 school year begins to wind down, three seniors in the Electrical Wiring class at the Bohlen Technical Center have put the finishing touches on a major project that has been their focus dating back to their junior year: wiring a greenhouse using solar energy. The greenhouse is located on the Bohlen campus and is used by the Pre-Tech Academy program. Plants inside the greenhouse were not growing properly due to high temperatures inside the building, necessitating a fan system that could blow hot air out and bring cold air in to maintain the greenhouse temperature at 78 degrees. Pre-Tech instructors approached James Rehley’s Electrical Wiring class in regards to the project. Taking it on were Bryan Nielsen, Dylan Hartle and Sean Spezzano, all of whom attend General Brown. They began work back in the spring of 2017 and continued working on the greenhouse into their senior year. The three worked on installing solar panels on top of a shed adjacent to the greenhouse. Energy collected by the panels is then wired to several batteries located inside the shed. Those batteries then connect to wiring inside the greenhouse which operates the fans. The fans are programed to kick on when the temperature is ready to get above the 78 degree threshold. The three students worked on digging trenches and installing PVC piping to connect the greenhouse and the shed. They were also given first-hand experience in installing electrical conduit inside the greenhouse. This part of the project forced the three to get creative in some instances to connect the wiring to the fans. “It forced us to think and to troubleshoot,” says Dylan. All three students say the greenhouse project proved to be a huge learning experience that should pay dividends when they enter the workforce.